The summer after I turned seventeen, I spent my days sprawled out on a wooden bench, wilting behind the glass of my treatment center's medical sauna. As I stared out at patients preparing for their own sessions, I watched the clock and wiped away the damage that 150 degrees can do. It was an ironic setting for a desert season. While in the sauna, I was allowed a glass of water, some white towels in a stack, and a pair of clean socks. Any other possessions were to be left in a locker. Twice a day, I would give the nurses my glasses, hair ties, and sandals, but I would keep a small piece of paper and slip it into my pocket. It was a prescription folded over twice, wrapped in cellophane, and signed by the center's medical director. The clinic had forbidden the use of any electronic devices: cell phones, walkie-talkies, smartwatches. After I had been there for several weeks, my doctor made an exception. I was the lone teenager loose in the building, his only pediatric patient, a kid in tremendous pain. Perhaps he knew I would need more than physical healing when he pulled out his prescription pad and put his approval in writing. I carried his note with me into the sauna and brought along an iPod so classic it didn't contain the warning light that shines when the device can no longer withstand the heat. I wasn't sure I could withstand the heat. It was suffocating to sit alone in that space. I was regularly put on oxygen, but it was the circumstances that often made me feel like I could not breathe. My illness became a lonely place to live. Once I had the prescription, I would lean back in the sauna and press play on my iPod, allowing the opening sequence of Revive Our Hearts to fill the silence. I sipped on water filled with tri-salts and received truth soaked with grace. I listened as Nancy taught from Scripture, telling the redemptive story of a big God, a sovereign God, a God who saw my situation. This God did not spare His own Son from the suffering of the world but sent Him into the middle of it. Immanuel. That's what His Son was called: "God with us." He did not leave me alone. The first few weeks that I was there, as I would step out of the sauna and walk toward the shower, the nurses would tell me that they could smell the toxins on my skin. I scrubbed harder to get the scent off my body though I knew the source was beyond the surface. As I returned for sessions and continued listening to ROH, I started to smell the bitterness, the discontentment, the self-sufficiency that was seeping out of my pores. I wanted to detox the fear I was wearing on my skin, the despair that left me wondering if there was any purpose to what I was suffering. At some point, somehow, there was joy, as Nancy taught about the blood of Christ that washes away our filth, about the way that Christ fills up our emptiness with hope, about the mercy of God that completely cures our sin-sickness. I had been struggling with physical illness for a long time. For ten years I faced worsening symptoms, and my family took me to doctor after doctor, some of the best in the nation, specialists who would take hours to study my case only to refer me on to someone else in their field or provide a treatment solution that did not last. We moved away from the home where my brothers and I had grown up, and when my symptoms became too severe, I was forced to withdraw from my high school. My identity, built on accomplishments at school, fell to pieces; my friends seemed far; my future lacked the certainty of a world I once thought I could control. Desperation changed my relationship with Christ. It was when it seemed like I had nothing that Jesus became everything. Anything That Makes Me Need God . . . I was not diagnosed with chronic neurological Lyme disease until a decade had passed, and in the process, I saw the truth of Nancy's words, even when they came wrapped in the messy reality of everyday life. "Anything that makes me need God is a blessing." I believed that. Then I began treatment for Lyme and started to slip back into some old habits, placing my trust in the doctor's hands and grasping at the hope of physical healing. God has been merciful to this slow-learning patient. Over and over again, I have listened to the lies that say a life without pain, a life without loneliness, a life without Lyme disease will bring the most fulfillment. I have banked my faith on blood tests and pill bottles, and when relief does not come, when I wake up with fever or with too much pain to function, the disappointment has been too much to withstand. In those moments, the Holy Spirit's whispered grace points back to the God who is with us. He will not leave me alone, and having Christ? It's better than having anything else this world could offer. Today, I am about five years into my Lyme treatment. I continue to pray for God to restore my health, but even if He doesn't, even if this treatment fails, it doesn't change who God is. He is still good; He is still all-powerful; He is still worthy of all of my worship. I will always long for health, but if it is sickness that brings me closer to Jesus, then it is a gift, and I am so thankful for it. 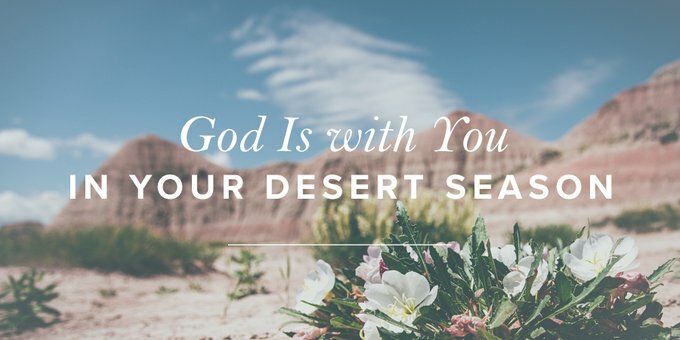 This God is the one who found me in the desert season; though the heat may press on, there is peace in the soul-satisfying refreshment of His presence. He draws near, and He is enough. In difficult circumstances or seasons of life, what characteristics of Christ do you cling to? Have you known Jesus to be Immanuel ("God with us")? If so, what difference has this made in difficult seasons or circumstances? What has God used to bring you closer to Jesus? How can we be grateful to God, even when life is hard?